Questions are amazing. If you think about it, every advance in humanity can pretty much be traced back to a simple question. How are we going to get from point A to point B? Why does my head hurt eight hours after drinking a pint of whiskey? How am I going to communicate with my family 500 miles away? The answers to many of life’s questions can be found in the minds of experts who have helped guide our societal growth. I’m fortunate enough to work with Ask.com, a website for asking questions and getting answers online. Ask.com is a client. And the cool part about that is I get to pick their proverbial brain to see what’s on the minds of Americans, which gets played back as the top questions asked about a particular topic. Of course I’m going to ask about the top hunting questions! And for your reading pleasure, I’m going to provide five of the top asked questions about hunting as a part one. Part two will include another five. I’m going to reveal the question and provide my answer to the question – plus, a bit of commentary with a few! I invite you to go to Ask.com to see what answers it provides! Who sells the best hunting knife? I’ve always been a Buck knife fan and carry the same Woodsman (No. 102K) on my hip that my brother Mike bought me almost two decades ago. I also like Gerber hunting knives and usually have one or two of those as a sidekick not too far away when I’m hunting. How much does hunting permit cost? I love that Americans are asking this question. Hopefully this means that more people are getting interested in hunting. The answer to this question, obviously, is very state specific. That said, I’ve rarely complained about paying the price to buy my hunting license. I’m a lifetime holder in two states, but typically hunt out of state at least once or twice a year. I’m well aware that it’s hunting license revenues that make the lion’s share of funding for a number of state-funded outdoor programs (I wish more anti-hunters would learn that fact). And because of that, I always feel that I’m doing something good. 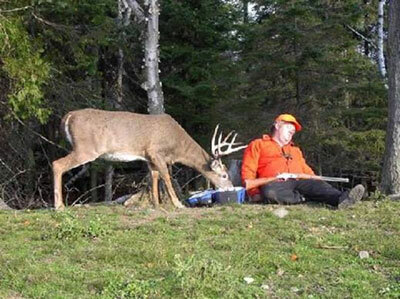 What percentage of Americans deer hunt? This is a great question. And I had to go to Ask.com to get the answer. Just seeing the question on the top questions list piqued my interest. I wish more Americans did participate. That said, the number is impressive. What choke is best for dove hunting? It seems to me that the one in my gun on the dove opener each fall is the wrong one! I’ve always had the best luck with a Modified or a Modified-Improved Cylinder. If you’re in a really good spot, that the doves really want to work, then I’m a fan of Improved Cylinder. What are some good exercises to help train my hunting dog? This question likely is asked so often by Americans just venturing into the world of owning a retriever, or respective hunting dog. This is where I would recommend that any new hunting dog owner purchase “The 10-Minute Retriever” by John and Amy Dahl. It is a fantastic, time-relevant book that helps lay a foundation for making your family floor rug into a suitable hunting companion. There are lots of exercises out there for training your dogs, but the ones in the Dahls’ book are some of the favorites of trainers around the world. This entry was posted on Tuesday, May 25th, 2010 at 8:40 am	and tagged with Ask.com, Hunting Knives, Hunting License, Questions about Hunting, Retrievers and posted in 2010, Top Questions, Uncategorized. You can follow any responses to this entry through the RSS 2.0 feed.